We've answered the question of which is better - popcorn or seasoning - with these dynamic new sets! Each interactive gift box includes 13 oz. 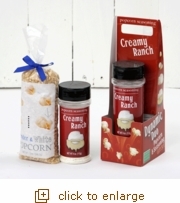 of gourmet Tender & White popping corn and a 5" jar of delicious Creamy Ranch seasoning. The corn is topped with a coordinating bow and is ready to give.